An imposing wall of rock that rises to 3000m, creating untold inspiring views and hikes. Known to the Zulus as the Barrier of Spears and to the first European settlers as the Dragon’s Mountains. 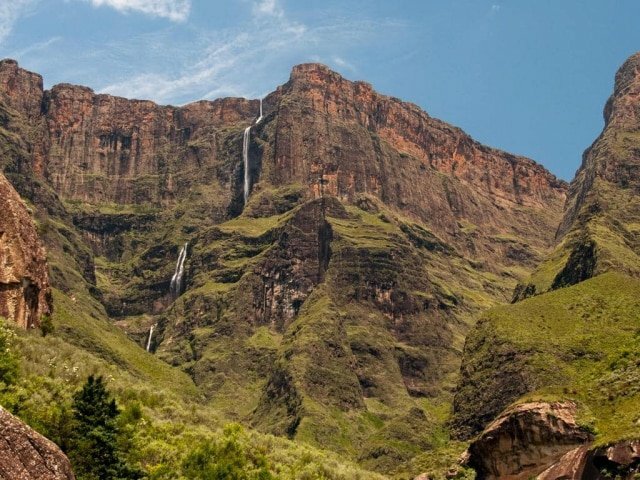 The Ukhahlamba Drakensberg is 1 of 8 South African UNESCO World Heritage sites, uniquely being on for both its significance as a natural resource and for the heritage of the San Paintings. For 1000s of years they hosted the San people and they in turn left their record on the walls on numerous sandstone caves. Today most of the Drakensberg is protected as a National Park and it is a major attraction for the lover of the outdoors.